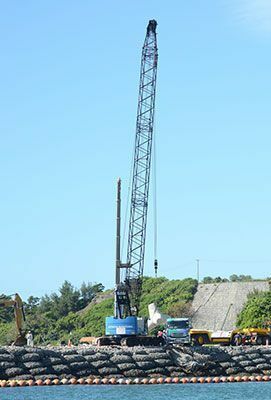 Cranes lifting and lowering wave dissipating blocks by the K9 seawall on July 7 around 9:00 a.m. in Camp Schwab of Henoko, Nago City. July 7 marked the fourth year since Okinawan citizens began sit-in protests in front of the U.S. military Camp Schwab. The sit-ins are to protests the new base construction, or the relocation of the U.S. military Futenma Air Station to Henoko, Nago City. Early morning on the same day, citizens gathered in front of the gate to once again reaffirm their vow not to let the base be constructed and raised their voices in protest. The protest began in front of the gate around 8:30 a.m. Kazuo Sena, who is the Secretary General of the Anpo-Haiki & Okinawa-Ken Toitsuren, an organization that aims to abolish the Japan-U.S. Security Treaty, gave a powerful speech and said, “Today is the start of the fourth year in which we fight. Once again, we want to renew our efforts to never let the construction of the new base happen.” The citizens responded with a round of applause in approval. Around 10:00 a.m., about 40 construction vehicles entered the base, causing temporary traffic on the road in front of the gate. Meanwhile by the sea, Okinawa Defense Bureau trailers were seen carrying in wave dissipating blocks for the K9 seawall on the north side of the landfill area within Camp Schwab. The blocks were then lifted and lowered by cranes. On the south side of the K1 seawall, workers were seen taking measurements. Citizens who oppose the new base construction protested from two protest ships and 13 canoes.